« How do you spell ‘Britney Spears’? 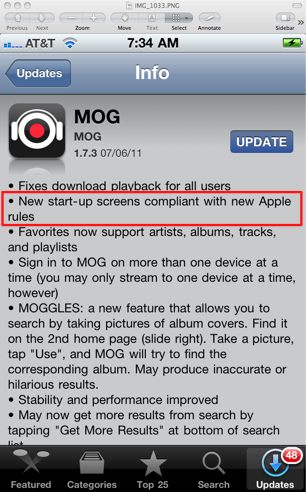 How are music services responding to Apple’s new TOS? There’s been quite a bit of turmoil around how IOS developers can sell products and subscriptions within their IOS application. Apple says, essentially, if you sell stuff within your app you have to give Apple a 30% cut and you can’t try to pass costs onto the customer by charging more for items purchased within an App. The cost for an item must be the same whether it was purchased through the app or through some other means. Update: In June, MacRumors reported that Apple updated its TOS so that content providers are now also free to charge whatever price they wish for content purchased outside of an App. Apple also says that you can no longer have a button or a link in your app to a website where a user can purchase content without giving Apple their 30% cut. 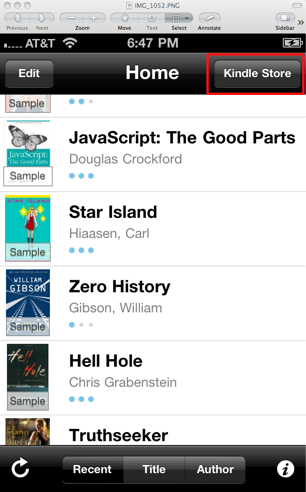 After the update, the Kindle App looks like this. 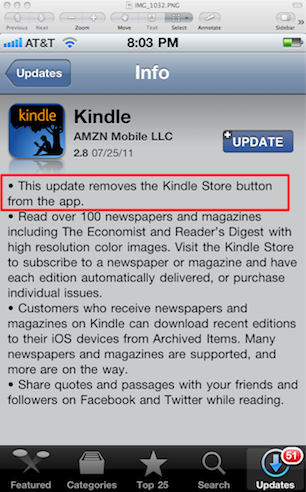 The Kindle Store button is gone. What are music services doing? I was curious to see how various music subscription services were dealing with the same issue. I fired up the apps, checked for updates and this is what I found. 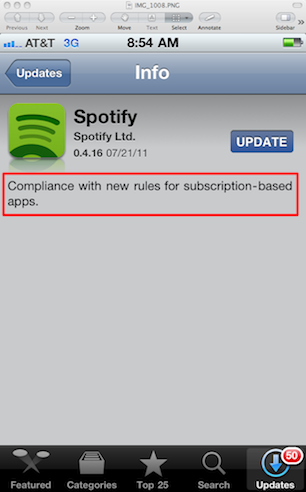 Spotify updated their app to get rid of any in-app purchases or subscription links just like the Kindle. You can only listen to Spotify mobile if you already have a Spotify mobile account. 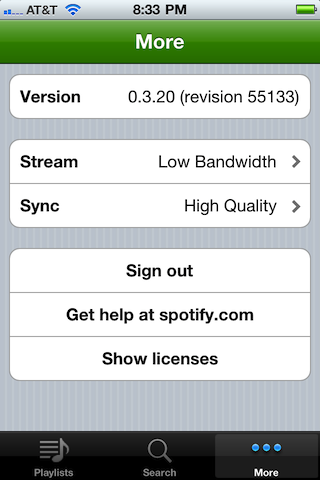 Curiously, there is a ‘Get help at Spotify.com’ button on the More page of the app. This will open a web browser and bring you to the Spotify Help page, which puts you two clicks away from a ‘subscribe’ button. This must cut pretty close to Apple’s rules about links to web sites. As with Spotify, SiriusXM, removed any links back to their site. 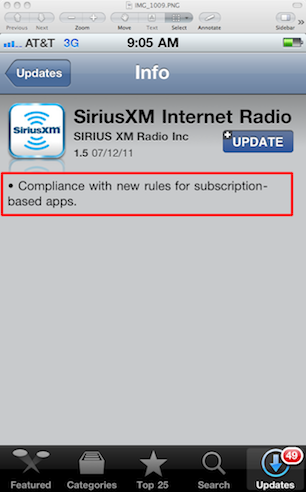 Only people that already have a SiriusXM account can use the SiriusXM app. 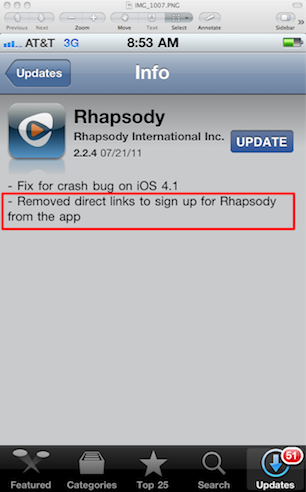 Same story for Rhapsody, there’s no way to get a subscription for Rhapsody within the Rhapsody Application. MOG issued in update in July that removed links to the MOG subscription portal. 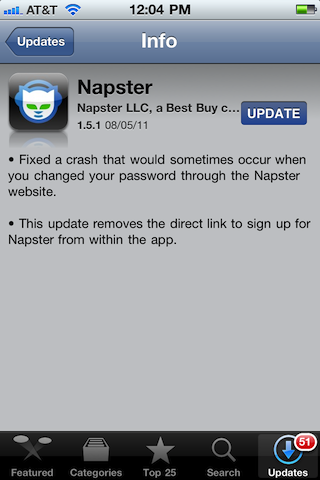 Interestingly enough, the very latest version of Napster happily allows you to register for Napster through the application. 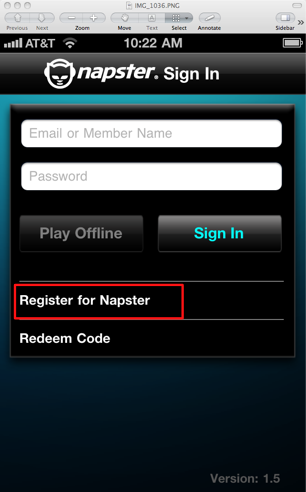 On the Sign In page there is a prominent Register for Napster button. I wonder what happens if a 7-day free trial user converts to a paying subscriber. 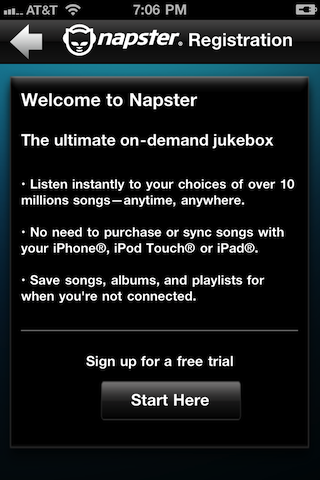 Does Apple get 30% or is Napster hoping that no one notices? 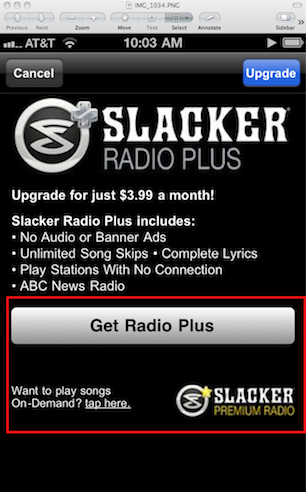 Slacker’s $3.99 a month Radio Plus product is included as a prominent upgrade in the Slacker app. If you hit the upgrade button you will get a form to fill out with all of your credit card info so they can start charging you the 4 bucks. The question is whether or not Apple is getting $1.20 of that 4 bucks. 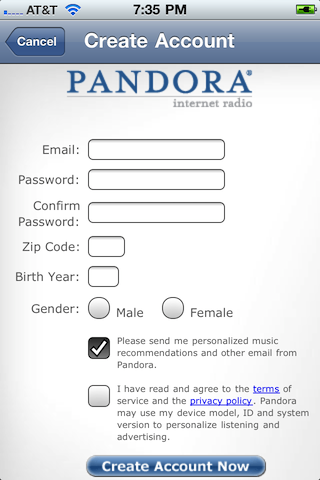 With Pandora you can create a free account through the mobile app, but there is no mention of a premium account, nor are there any links to Pandora.com as far as I can tell. 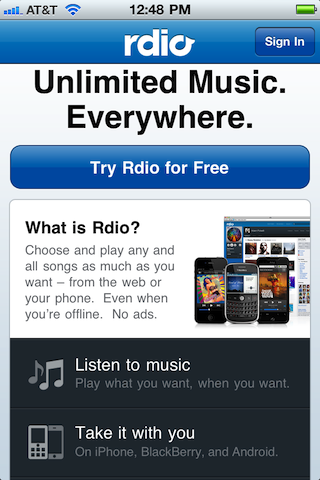 Rdio takes a similar approach to Pandora and Last.fm. 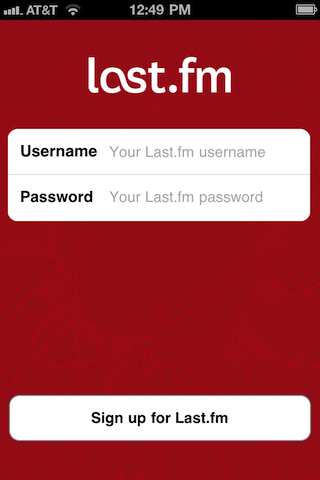 It allows users to sign up for a 7 day free trial account via the app. It makes no mention and has no links to a premium subscription page. It is not clear to me what happens at the end of the trial period, whether they will prompt you to visit Rdio, or if they just say “Your free trial is over, thanks for listening”. This allows you to purchase the Rdio subscription for $14.99, which just happens to be 33% more than an Rdio Unlimited subscription would cost if purchased directly from the web. 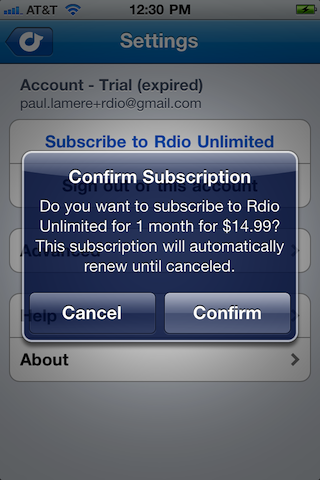 Rdio is taking advantage of Apple’s recent relaxation of the rules and seeing how effective in-app subscription purchases stack up against cheaper out-of-app purchases. There’s a good LA Times article Rdio attempts to survive Apple’s subscription tax that describes Rdio’s approach to dealing with this issue. 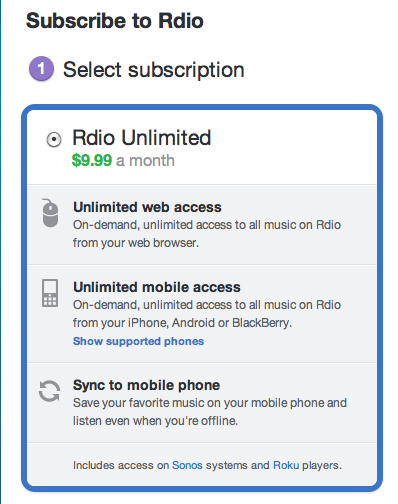 A monthly Rdio Unlimited subscription is 33% cheaper when purchased on the web. 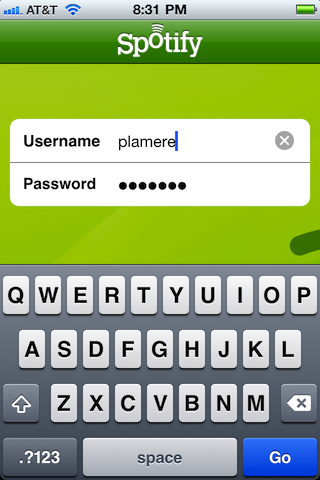 The latest version of Playme doesn’t have a button or link that brings you to the Playme subscription page. 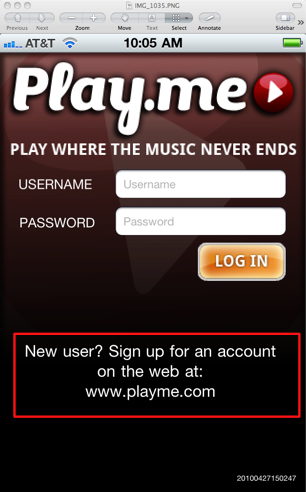 It does, however, display http://www.playme.com prominently on the sign in page so you can type the URL directly into your browser. I guess technically the words http://www.playme.com are not a link if you can’t click or tap it to go there. Grooveshark has never been timid of walking up to the line and stepping across it. 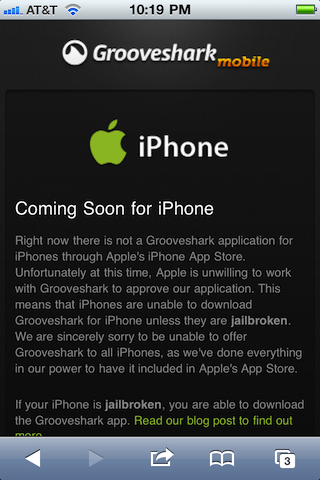 The only way to get Grooveshark on an IOS device is to Jailbreak your device. With a Jailbroken version, Grooveshark doesn’t need to pay anyone for anything. Apple has always been a company that prides itself on encouraging an excellent user experience. However, when Apple had to weigh a good user experience against potentially making 30% of every music subscription they decided to screw over the user and go for the pot of money. The reality, is, however, that no music streaming company will ever be able to afford to give Apple a 30% cut. The result is that these apps have to work around Apple’s rules, the result being a poor user experience, and no money for Apple. Hopefully, by the end of the year, Apple will look at the bottom line and realize that they’ve made no extra money from the 30% rule, and instead have encouraged the creation of a big streaming pile of music apps that make the user jump through all sorts of unnecessary hoops for no good reason. Note however, that the story isn’t over. 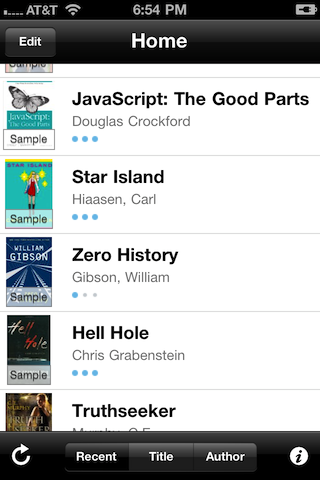 Rdio is experimenting with in-app subscription purchases. If they are successful at this, in a few months time, perhaps we’ll see Spotify, Mog, Rhapsody and the others try the same thing. This entry was posted on August 4, 2011, 8:56 pm and is filed under Music, recommendation. You can follow any responses to this entry through RSS 2.0. Both comments and pings are currently closed. Special prizes to Napster for being so slow on the uptake and Rdio for finessing the legalese. Really fantastic post! While the app selection on Android is getting better, it is still frustrating when there are iOS apps and not something for Android. This makes me a little happier that I don’t have to deal with Apple and its abuse of power.